Not very long ago I had a wardrobe that included orangey reds and bluey reds, soft greyish pinks and bright pinks, greeny aqua and pea soup green, cream shirts and white shirts. 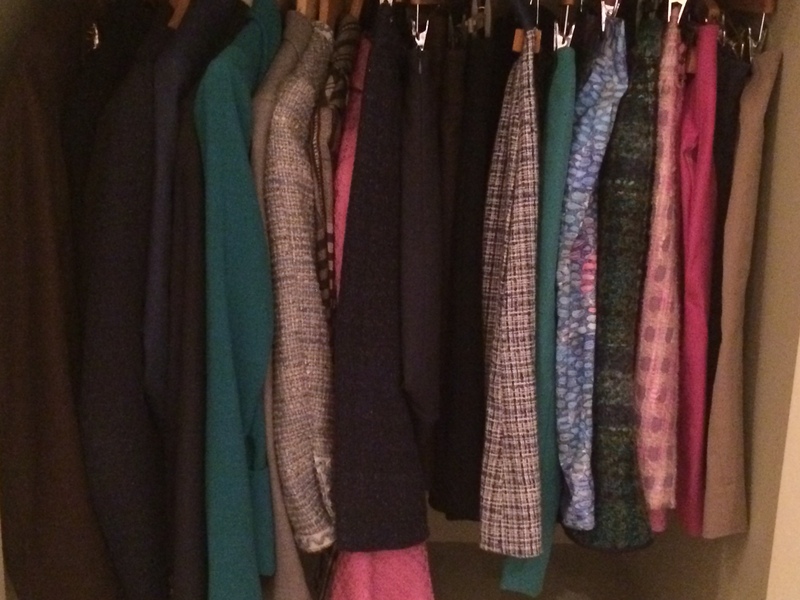 I had more than enough clothes because I was continually buying “outfits” – yes that shade of blue will go with that particular skirt, or I need a find a top to go with that particular shade of brown trousers. With so many colour schemes and outfits I managed a coordinated look but it was hard work, expensive and required alot of storage space. And I wasn’t really sure which colours looked best on me. Since I have discovered my own primary colour direction is Cool – I have taken 70 per cent of my wardrobe to the Oxfam shop. This means that every item I have now has a cool (blue) undertone. As a consequence every item co-ordinates with every other item. 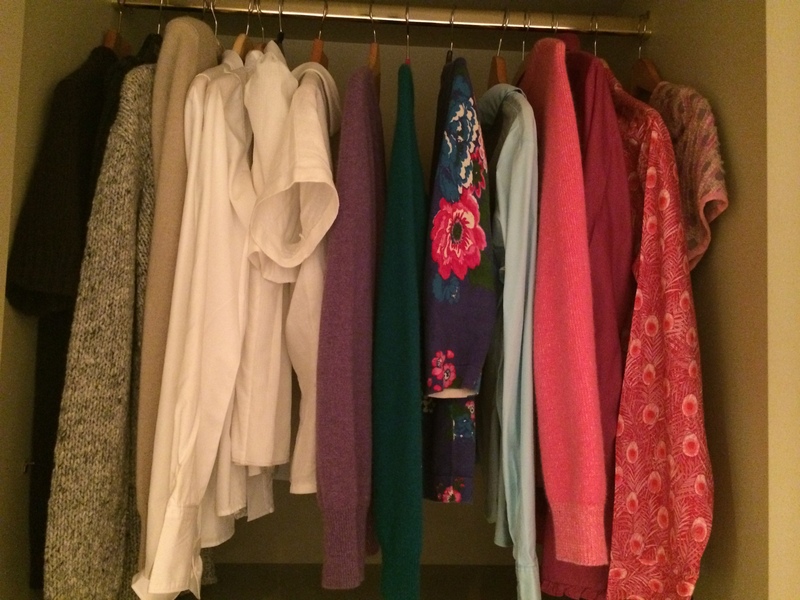 I have created the holy grail – the capsule wardrobe. 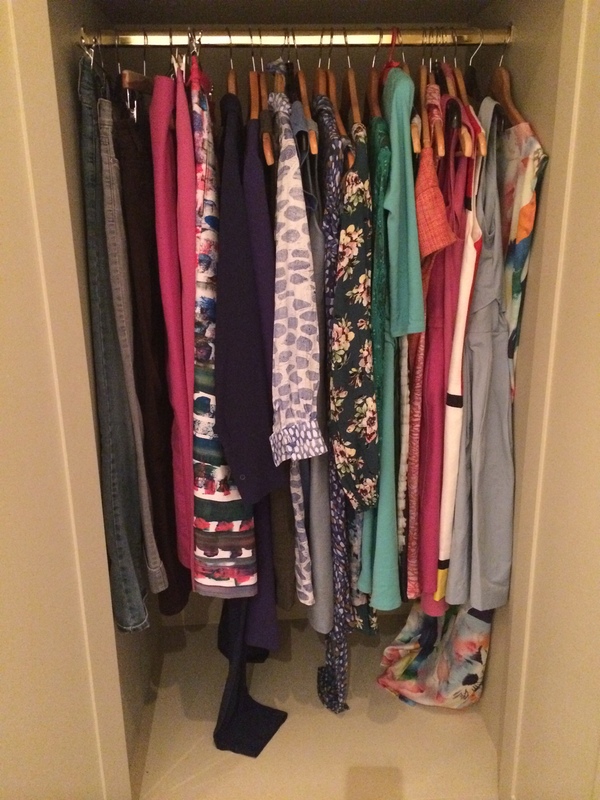 None of us really want a wardrobe that it is bulging with clothes, colours and styles. How much easier to have fewer clothes where each element is useful and works well with several, if not all, of the other items. This seems to be a challenging project for many of us, and there are many articles telling you to go out and buy more stuff so you can create a capsule wardrobe eg the leather jacket, the white shirt, the LBD and so on. Full disclosure. You are about to see the inside of my wardrobe. I have far too many clothes. There are 18 dresses, 11 shorter skirts and two longer ones. I have approximately ten jackets. It may appear that I am short of tops but I have another lot folded up. There are four pairs of trousers – blue, grey and brown jeans and a pink pair I made. Having said that there is nothing here that I do not wear regularly. There are some very summery items that I will put away once it gets cold again, and there are four coats that were put away in about May. The summer dresses will hibernate while the coats will come in from the vaults. But on the whole this is an all-season wardrobe. Its arranged by tops/bottoms/dresses; within those groups it is broadly colour coded as that is how I think about what I wear. Despite the fact that there is no shortage of items there are a few things that I would like to replace. I have three Jil Sander Uniqlo suits (c. 2010) One is navy, one is dark brown and one is bottle green. Plus a blue-grey suit I had made when I was in Hong Kong. These are my work staples, and they are getting somewhat shabby. My task over the next year is to gradually replace them with three or four new suits that I will make in the same colours. In addition I would like a yellow jacket but I have yet to find some suitable fabric. I will make other things but these are the items I, sort of, need. Rather than telling you to buy x, y or z to form your capsule I would suggest a simple approach, which doesn’t have to cost anything at all. Your local charity shop, or Ebay, will be pleased to take your excess baggage. You may find yourself letting go of garments which are unsuitable and unflattering, but what will be left will be useful and look nice. decide on which colour palette suits you best. This will be deep, light, cool, warm, bright or muted colours. Each palette includes all the colours. We are talking about the best shades of each colour. Best to get a professional opinion on this as it can be hard to tell. Or read my posts on colour which can help give you some clues. get a supply of bin bags – one is labelled Rubbish, one (or more) Charity Shop, one small one for Refashioning/Repair, one to Give Away or Sell. pull everything out of your wardrobe and Hoover it. Keep the wooden hangers and put wire or plastic ones in the Rubbish bag. discard any items which are too small, big, tatty, the wrong length etc. anything which doesn’t fit colour wise gets excluded. If you suit warm colours everything with a blue undertone has to go, etc. If you have a lot of one item that you know suits you (eg grey tops in my case) keep the nicest ones, but the rest go to Charity Shop or Give Away. hang, or fold and stack neatly, the neutrals together eg white, beiges, greys, blues, browns. hang, or fold and stack neatly, each colour together eg red, orange, pinks, purple, blue, green, yellow. later, when you have taken all the bags to the correct place repeat the process with your shoes, accessories, underwear, jewellery etc. I promise that if you stick to one colour direction, and especially if this is the one that tones best with your natural colouring, then everything will work well with everything else. This is exactly where I’m at. (happily my daughter was able to adopt the bad green coloured leather jacket :~ ) I still haven’t found a home for the red long cashmere coat (wrong red)……….I love it so, but……..I will bite the bullet and donate – immediately , thanks to your post. Yes, yes, it must go. darn. OH well.. that just makes room for something else, in the right hue. I do have a pattern for a swing coat ;~ ) and a lot of blue muted material, we’ll see what happens. Before you did my colours, I had black and white as my neutrals, and already I had streamed down my wardrobe to very little. I tired to remove the black and white all at once, and it left me very short, feeling slightly depressed. However…I quickly got on to the plan to replace the black with (my )grey, the white with pinks and blues and …….and its been very refreshing. I have also picked up a few things in my brown. Slowly, but surely IM getting to a better place and everything does go with everything which is just fabulous for quick confident dress in the morning— as I mostly have to think about what is appropriate now. I also have my wardrobe organized like you do. Like things together and then grouped in colours. Its getting colder here, already I have added jackets. I think my favourite thing of all time is cleaning my wardrobe! What I think is especially interesting is your thoughts on choosing your most flattering colour scheme which is interesting as I. Remember a few years back when that was all the rage and how it appears to be less spoken about in recent years. I think a good colour scheme really does help! I’ve been trying to keep to the warm colours but I admit I do sometimes buy a piece of cool even though it doesn’t suit me! Opps. . . Lovely post can’t wait to read more! This is so tantalizing! I love cleaning things out and narrowing my choice set! I do a wardrobe clean-out about once a year, but that usually just involves taking out things I will definitely never wear again. I am still not even sure what my colour direction is – probably muted – though your posts have been very helpful in thinking about colour. I fully admit I’m a “uniform” dresser. That is I like to wear things I know go together and prefer less than more. I would love to be able to replace when needed and not go beyond the edges of my closet. I can do so much better, you have inspired me to do the deep dive. I will need to give more thought to my color palette. I believe it’s cool colors but I’m not sure. It looks a very well curated wardrobe to me. You raise such an interesting point here Kbenco. I don’t really think I struggle with this as I go for a pretty standard silhouette myself (generally wearing a fitted top and a looser fit for skirt or trousers). I surprise myself when I try something different (eg the “boyfriend” coat I made my daughter) and it works. I will have a think about this over the next few weeks because I expect it is as important as colour. Thank you very much for making me think! A wardrobe to yourself!? What luxury. Mine is shared and currently crammed 🙁 with my son’s clothes too as his room undergoes a refurb. Your post is very well-timed as I’m beginning to realize how paralyzed I am by the sheer amount of stuff, much of which I don’t enjoy wearing but keep because it was a good find or because once upon a time it worked.